Diemme offers a progressive cavity screw pump designed to meet the output of their Kappa destemmer/crushers. The pump includes a minimum level sensor and auto-start with product presence. Francesca pumps are positive displacement using an innovative rotary piston technology. Francesca introduced the first pump in 1995 and to date over 2,200 have been sold in Italy, France, Spain, Portugal, Germany, Argentina, Chile, South Africa, Australia, Canada, and the United States. Francesca positive displacement pumps are extremely gentle on must/wine and versatile. Francesca pumps are self-priming and can pump must (without shearing skins and crushing seeds), juice, wine, lees, fill and top-off barrels. They are ideal for wine pump-overs and filtration. At maximum speed, the rotary pistons operate at 290 rpm and less than 3 bars. 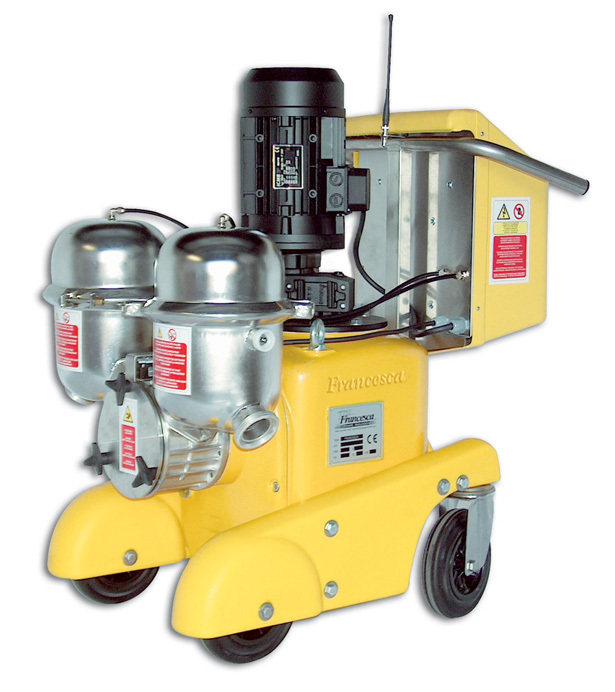 Francesca pumps can be operated by wireless remote, are reversible, and the operator can shut-off against it. The soft stop/start feature ensures a gradual, gentle flow. Francesca offers pumps and wine pump overs that operate at maximum speeds of 40, 75, 88, 114, 132, 154, and 264 gallons/minute. The Diemme progressive cavity screw must pump is complete with a stainless steel hopper and infeed augerfood grade rubber stator, stainless steel rotor, minimum level sensor, automatic start with product presence, and a dry run protection sensor on the stator. Diemme offers must pumps that operate from 5 – 90 tons/hour.